Spencer was trimming his beard on the back of the boat when the storm hit. It was calm and cloudy a second ago. Then a vicious gust of wind barreled down out of nowhere and all hell broke loose! We were at anchor in Rikitea. About 10 sailboats had left the day before, heading towards the Tuamotos with the SE wind (it had finally switched, after almost 3 weeks of northerly winds). We had been monitoring the weather charts. They had indicated a “high pressure” moving in with strong winds and rain. We interpreted this as “clearing winds” after a low has passed, a phenomenon we are used to in California… but what of the rain?? We weren’t sure why there would be rain ahead of a high pressure. Our friend Rick on the catamaran Duplicat (which visited Pitcairn for a day with us) left earlier that morning for Taravai island — which is next door to where we are in Mangareva island. Later they reported by satellite email they got hit by 40knot gusts and zero visibility as they were exiting the channel. Quite sketchy! So they said “screw it” and turned north toward the Tuamotos. Meanwhile on Aldebaran, gusts hit us like bowling balls from the north, south, east and west. When the boat finally turned at anchor to face the last blow, another blow took us broadside. Sheets of pelting rain came down on Spencer like needles. Did he stop trimming his beard? Of course not! In some of the worst beard-trimming conditions known to man, Spencer laughed and hollered like the wild Captain Dan in Forrest Gump, hanging on to the mast in the storm. Until it got too bad. “Uh-oh!! !” Spencer warned. A full minute of deceptive calm had just passed. Now behind us there was a stretch of smooth water, one of the 40 foot sailboats at anchor was heeling over at 40 degrees due to an incoming gust. The wind was blowing it over! The wind line approached us like a marching army, kicking up frothy swirls into the air, ripping up the previously calm water into shreds. Next thing you know, our vynil windows were flapping violently as rain drove horizontally into the cockpit. Across the way, the neighbor’s skiff caught air with the katabatic-like gust, and flipped upside down, outboard engine in the water! What a bummer! “Is that one of our surfboards in the water? ?” Spencer cried over the din of the wind. A white object floated 100 feet away. We jumped into the skiff and motored over there, covering our eyes from the stinging pellets of rain, but it was just the outrigger of a canoe, certainly owned by some locals. We secured it in Aldebaran, and side-tied the dinghy to keep it safe. the chaotic, tornado-like wind finally veered to the SE, and blew like stink. 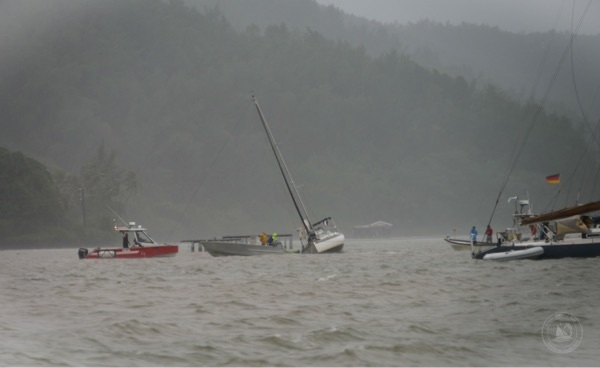 A 30 foot sailboat rain aground on the reef, his mast stuck at an angle like the wing of a wounded eagle. A few powerboats came to the rescue and pulled the boat successfully into deeper water. We later got a report from our friends on Pakia Tea that they had anchored in a bay in Taravai for protection from the strong SE wind that was forecasted, and then got hit during that chaotic hour by a westerly wind of over 40 knots which would have landed their boat on the reef, had the anchor not re-set properly. The Gendarme (local police & port captain) said that at the weather station located at the top of Mangareva, a gust of 120mph was recorded. Crazy! This was the storm that forced Deena’s flight to turn around. It blew steadily for two days with rain and poor visibility. Aldebaran remained comfortable at anchor, hanging onto Mr. Bruce, our 66lb hook with 230feet of chain. We collected rainwater and watched the new Kon Tiki movie inside our cozy cabin. We now have new respect for strong winds that come with high pressures here in the tropics. Its not just low pressures that can bring fronts of rain and wind. Scary! Hi Deena’s boatmates. It’s Deena’s mommy. Thanks for sharing great stories and beautiful photos. Thank God the last chapter of this amazingly well written story was inside a cozy cabin! I was riveted and getting pounded by the rain until I read the magic words ‘Aldebaran remained comfortable at anchor’. Glad your hook held! We were pleased we made the decision not to try and get into an anchorage and carried on. We did wonder whether the flight would make it as we barreled along at 7-8knots under bare poles! We’ve had a fantastic welcome in Amanu – highly recommended. The mayor invited all of us for lunch yesterday as they’d never seen so many boats here. Wonderful reception and great to see so many friends from Rikitea here! Yikes!…. but it sounds like you came through it with colors still flying, and enjoying the wild ride!